You know what the scariest thing is? To not know your place in this world. To not know why you're here... That's... That's just an awful feeling. (SOME SPOILERS) In the fourteen years since The Sixth Sense went from sleeper hit to box office titan, M. Night Shyamalan’s cachet has taken a significant tumble. Initially impressed with his distinctive narrative and visual approach, realisation dawned that he was, by all appearances, a one-trick pony. The appetite for his tales-with-a-twist diffused and, in seeming recognition (or, through difficulty in finding funding) he turned to adapting others’ material. First up was The Last Airbender (which, I admit, I still haven’t seen) and this summer comes Will Smith & Son in After Earth. But Unbreakable was his first post-Sense picture. Bruce was back. Big things were expected. And it did well at the box office, it’s just that well was only a third of the gross of his spook story. 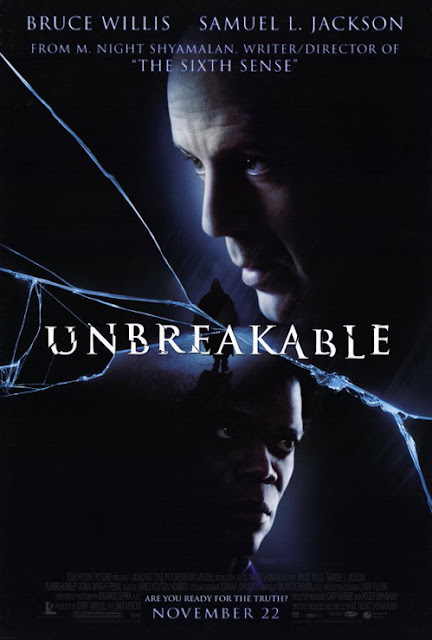 When I saw Unbreakable at the cinema, I instantly preferred it to its predecessor. In part, guessing Sense’s twist in the first fifteen minutes rendered it too predictable and calculated for me; I admired the filmmaking and the performances but that reveal was all there was to it. The rest was just filling out the twist, with an earnest tone that sold it as sincere. Unbreakable’s central conceit, ironically, takes a lot more swallowing. But I admired what the director was attempting to do with the superhero genre, even if he proves only partially successful. Shyamalan’s Achilles Heel (aside from originating his own material, but that’s a given) is that he’s a pretentious filmmaker; he imbues his subjects with a sense of importance that invariably, when stripped away, reveals very limited substance in terms of depth and theme. Pushed, that scale can tip further into outright silliness (Lady in the Water, The Happening). Unbreakable sees the director working back from his premise in the same manner he did for The Sixth Sense, it’s just that this time he reveals his subject early on. The twist is not so central, it’s in the abilities or otherwise of Willis’ David Dunn that the film’s impact lies. The additional layer of self-reflexivity in having the characters represent, and comment upon, the rules of comic books never has the impact Shymalan clearly wants it to, perhaps because he makes such heavy weather of it. So we have a man who survives a train crash unscathed, when all the other passengers died. The whys of this are seized upon Samuel L Jackson’s Elijah Price, the fright-wigged owner of a comic book art gallery who suffers from a brittle bone disorder. And that’s where Shyamalan begins to strain credulity. He does well setting up his characters; David is first seen concealing his wedding ring as he unsuccessfully attempts to chat up a fellow passenger. In shorthand, the director deftly establishes David’ unfulfilled existence. And, all the while, the camera sits behind the opposite seats, shifting angle with the speaker. David’s a blue collar guy, could have been a pro-footballer but an injury put him out of the frame. His marriage is not working, and he’s due to move on his own to New York. His son idolises him, of which he feels profoundly undeserving. All of this, the director communicates with restraint and confidence. Understandably, David thinks Elijah, who was nicknamed Mr. Glass by his schoolmates, is a nut. But the problem comes with the profound questions David is asked. I find it very hard to swallow that David would have failed to notice that he never gets sick; in trying to transpose a fantasy genre to the “real” world, Shymalan falls prey to suspect logic. And because the revelations hold such weight they invite proportionately greater disbelief than if they had featured in a less portentous piece. David’s a very forgetful man; he also forgot a childhood trauma crucial to the plot. Somehow his wife never learned of it (despite being together since they were teenagers) and also never noticed his amazing good health. And, while it provides a neat shortcut for discerning folks in danger, imbuing David with a clairvoyance that he has hitherto suppressed (conveniently, like everything else) seems to over-egging the pudding (is there no limit to this man’s abilities now he’s discovered them?) Perhaps it’s a result of Elijah interrogating his history, but it encourages the viewer to do likewise, and you come up realising that the director is desperately hoping (or arrogantly confident) that the IMPACT of his revelations will be enough. It’s this same over-earnestness nearly topples the scene where David’s son Joseph (played with slightly creepy conviction by Spencer Treat Clark; Shymalan certainly seems able to cast preternatural kids in his sleep) points a gun at his father, convinced that the bullets won’t kill him. It feels like it was shoehorned in because the director thought it would provide dramatic meat, and there’s a resultant impulse to laugh derisively at it. But, and this is a big but, Shymalan’s slow-but-sure approach to pacing, framing and editing is immensely appealing. Particularly in an age of quicker-faster-better. An effective early example sees David and Joseph gradually increasing the weights he is lifting to see how much he can carry. Later, when it comes time for David to test his powers as Windcheater Man, the director is ready to ride a cathartic wave perfectly supported by James Newton Howard’s swelling score. Willis is dependably impassive, which suits the part, although this is unfortunately part of his minimalist phase as a “serious” actor. Jackson reins it in a bit, and thus is reasonably effective. Robin Wright Penn does much with a limited role (the convenience whereby Elijah ends up receiving physiotherapy from Audrey is another point where the conflagration of coincidences demands viewer suspicion). I can’t help but like the film, and the director’ style generally; even with his last couple of movies I’ve found some merit on that score. It’s unfortunate that he chose to flash up a “What happened next” text in lieu of proposed sequels; it’s pretty clear what’s going to happen, and spelling out is a little trite. Then, I guess so is his oeuvre, since it assumes the viewer will be more than content with the surface details and look no further.